Residents that make up the popular 'Knit and Natter Group' at Broomhills residential care home in Rochford, Essex, knitted poppies for the Poppy Appeal in November. The Poppy Appeal marks the end of the World War 1 centenary by saying thank you to all who served. 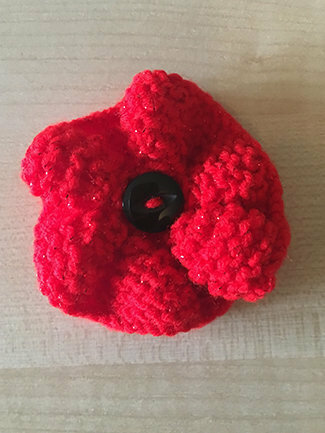 The gorgeous knitted poppies were sold during the period of Remembrance at Broomhills to relatives of residents as well other visitors to the Rochford care home and the novelty knits raised £63 which were put in the Royal British Legion Poppy Appeal 2018 donation pot. Well done to residents for using your skills to produce such wonderful creations to be sold for a very worthy cause. Broomhills is a beautiful, 47 bedroom, residential care home situated in Rochford, Essex, overlooking the Thames Estuary. This stunning care home in Rochford, with charming grounds, provides 24 hour expert care for older people, including those living with dementia. For more information call 01702 542630 or email broomhills@runwoodhomes.co.uk or visit the Broomhills web page by clicking here.